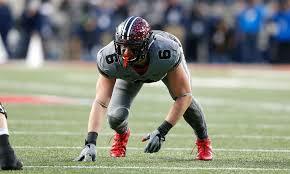 Sam Hubbard, a former Safety that blossomed into a DE while at Ohio State. His projections are all over the place and he is certainly being slept on. At 6’5″, 270 lbs he is a load on the edge, and he will certainly make a team happy after the draft. Nimble for his size, he uses his speed to get past slower Tackles with ease. The draft is unpredictable, but a team is likely to take a chance on him.